... make them into a centerpiece. Ha! First off, HAPPY SPRING! I normally hate the use of all caps because I don't like to feel yelled at. But in this instance, I am yelling from the rooftops and will now add bold, italics, underline and a new color to emphasize my excitement about Winter being officially over: HAPPY SPRING!!!! Isn't it sweet? She had the little cake stand on hand: it was pink glass and she bought it years ago at Anthropologie. The pink no longer worked in her home, so she sprayed it glossy white. Then she found this cloche at Goodwill for just $2.00. She took away the wood base and stuck the glass top on her hobnail cake plate. I just love it: the look, the price (next to nothing!) and the punchy yellow of those lemons. She bought some fake lemons for a song ... but you could also use real lemons if you wanted to. Here it is on her countertop again. 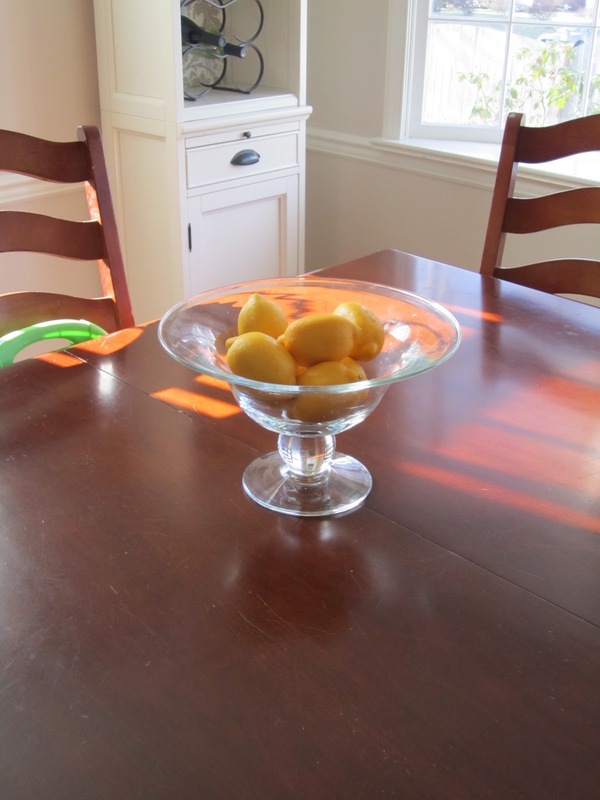 In fact, I was so inspired by Heather's cute DIY centerpiece that I went out and bought a pack of faux lemons from Target for $4.99 and popped them in my glass bowl for my own cheap and easy ode to Spring. See? Yeah! Spring is in the house! Got any cute and easy DIY projects? Share share share! Right there with you! I love lemons especially in Spring. Mmm.